Includes 3) 12-button phones expandable to 4-lines in X 8-phones with major expansion to as much as 90 phones with additional hardware. Plus free phone system programming with 60 days of updates and life time support as long as you own your system. For the small business with the needs to seem like Big Business. Includes 3) 12-button phones and voice mail, expandable to 4-lines in X 8-phones with major expansion to as much as 90 phones with additional hardware. Plus free phone system programming with 60 days of updates and life time support as long as you own your system. 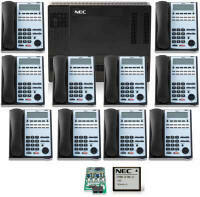 2 affordable NEC 6 phone kits available with either 24 button phones or 12 button phones. Both include free phone system programming with 60 days of updates and lifetime support. expandable to 4-lines in X 8-phones with major expansion to as much as 90 phones with additional hardware. 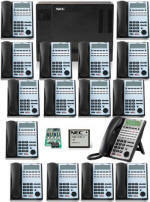 The pure IP phone system includes 6) 24-button IP phones, voice mail, a 16 channel IP expansion card that can expand to as many IP phones as needed although 16 phones or lines will be able to be in use at one time. This means if you have 24 phones and the most phone calls your business has at one time is 5, you would be using 10 channels of the 16 channels available. Also includes free phone system programming with 60 days of updates and life time support as long as you own your system. Includes 10) 12-button phones and voice mail, expandable to 4-lines in X 16-phones with major expansion to as much as 90 phones with additional hardware. Plus free phone system programming with 60 days of updates and life time support as long as you own your system. Includes 15) NEC 12-button phones, 1) 24-button reception phone, and voice mail, expandable to 4-lines in X 16-phones with major expansion to as much as 90 phones with additional hardware. Plus free phone system programming with 60 days of updates and life time support as long as you own your system. 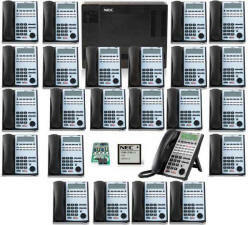 Includes 23) NEC 12-button phones, 1) 24-button reception phone, and voice mail, expandable to 4-lines in X 24-phones with major expansion to as much as 90 phones with additional hardware. Plus free phone system with 60 days of updates programming with 60 days of updates and life time support as long as you own your system. Hotel Phone System for up to 40 Rooms includes: 1) Reception Phone, Capability to support up to 40 existing single line room phones, supports up to 4 lines in, Wake Up Call, Free Programming with 60 Days of Updates and Lifetime Support. Two phone models to choose from. The 12 Button phone has 12 programmable buttons for what is known as line appearance that is not available on the hosted IP systems plus all the standard buttons you would expect. The 24 button phone has 24 programmable buttons plus all the same features as the 12 button phone. 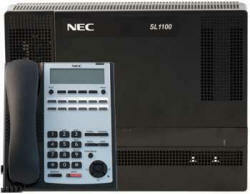 The latest NEC Cordless Phone is the DECT 6.0 that is the next generation mobility solution for the busy office. 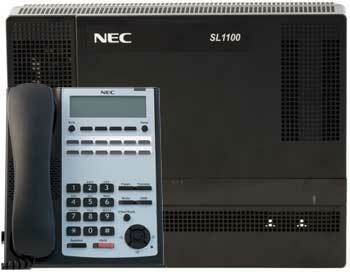 This new cordless phone for most NEC systems uses advanced DECT wireless technology for improved clarity and range. 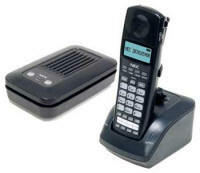 The Cordless DECT Telephone offer the same extensive DSX feature integration as its sibling Cordless Lite II, such as Call Forwarding, Call Coverage, Hotline, and Voice Mail. Additionally, the new Cordless DECT has 4 more fully programmable function keys with LEDs (8 total!) for even greater mobile operability in a compact handset.